May 16, 2018 at 1:45 pm EDT | by Lou Chibbaro Jr.
U.S. Army Capt. Tim Brown, who was awarded two Bronze Star Medals for two tours of duty in Afghanistan, currently serves as an Army chaplain at the Fort Bragg Army base in North Carolina. Brown, 46, says he and his husband, Honduran immigrant Sergio Avila-Rodriguez, 24, were hopeful last Thursday that a scheduled visit to the U.S. Citizenship and Immigration Services office in Charlotte, N.C., would bring his husband one step closer to obtaining a marriage waiver. Avila-Rodriguez had applied for the waiver last year in an effort to obtain permanent U.S. residence and to end his status as an illegal immigrant since the time his uncle first escorted him across the U.S. border from Mexico into Texas in 2002 when he was eight years old. But according to Brown, the couple’s hopes were shattered, at least temporarily, during their May 10 visit to the Charlotte CIS office when agents with the U.S. Immigration and Customs Enforcement, known as ICE, took Avila-Rodriguez into custody. While Brown was waiting in a nearby restaurant for what he thought would be a routine visit by his husband to assess the status of his marriage waiver application, the ICE agents told Avila-Rodriguez he was being taken to a detainment center in Georgia with plans in motion to deport him to Honduras, where he had not been since the age of 8. Immigration officials released Avila-Rodriguez on Monday, May 14, pending a ruling on a motion his lawyer introduced on May 11 appealing a deportation order that the motion placed on hold but that could be reactivated if the motion is denied. “I feel this was a setup,” Brown told the Washington Blade. 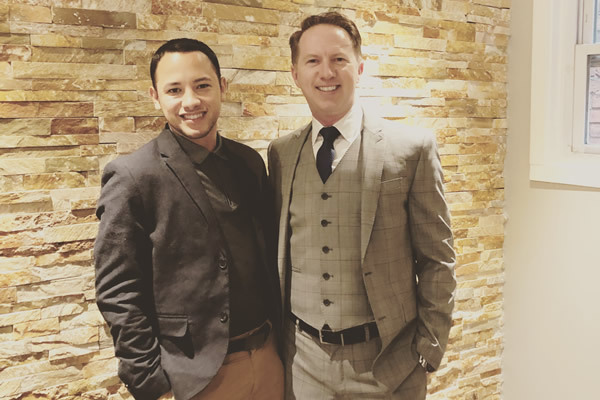 “We went to the first marriage waiver interview a month ago,” said Brown, noting that he and an immigration attorney representing his husband went to the interview without Avila-Rodriguez at the advice of the attorney, Patrick Hatch. Hatch told the Blade that as a precaution against potential efforts by ICE to detain immigrants in situations similar to the Avila-Rodriguez case, he routinely requests that his clients stay home while he goes to such meetings on behalf of his clients. Despite the missing file, the immigration officials agreed to make an exception and grant Avila-Rodriguez the marriage waiver, Brown said, adding, “They told us to come back again with Sergio” on May 10. “The ICE agent told us then, ‘Do you think that I am going to detain and deport the spouse of a military officer?’” Brown said. Attorney Hatch said based on the assurances by the immigration officials, including an ICE representative, he believed Avila-Rodriguez had cleared his main hurdle and the marriage waiver would be granted. Brown said that when he and Avila-Rodriguez returned to the Charlotte immigration office on May 10 a guard at the entrance to the building told Brown he could not accompany Avila-Rodriguez to the meeting inside. Thinking this was a mere technicality for what would be a routine meeting to move forward with his husband’s marriage waiver application, Brown said he went to a nearby Starbucks to wait for Avila-Rodriguez to come out. But he grew worried, he told the Blade, when he heard nothing from his husband for nearly four hours after the 9:30 a.m. meeting was scheduled to begin. Brown said he immediately called Hatch, who, along with other attorneys in his law firm, Hatch Rockers Immigration, tracked down the case and discovered the reason for ICE’s action. In a development that Avila-Rodriguez had long ago forgotten, Hatch learned from immigration officials that Avila-Rodriguez and his uncle were stopped at the U.S. border in 2002 and Avila-Rodriguez was ordered to return to a court in Harlingen, Texas, a short time later to deal with his illegal immigration status. Hatch said he learned last week that Avila-Rodriguez’s uncle brought the then 8-year-old child to his parents’ home in North Carolina and never brought him back for the Texas court hearing. That prompted immigration officials in 2002 to issue a “removal order” against Avila-Rodriguez that remained in the U.S. immigration court system records for the next 16 years. The immigration officials, including ICE agents, apparently could not find that record last month when Avila-Rodriguez was given tentative approval for his marriage waiver application. Hatch said that when they finally discovered it ICE revoked the approval of the marriage waiver. Both Hatch and Brown said a further complicating factor was the fact that Avila-Rodriguez had been arrested in North Carolina on a misdemeanor drunk driving charge at the age of 21. “We worked through every legal course of action to reconcile that,” said Brown, who noted that immigration officials had given preliminary approval for the marriage waiver last month despite the driving arrest. Hatch, meanwhile, said he and his legal team worked on May 10 and 11 to file a motion to reopen the 2002 removal order case on grounds that Avila-Rodriguez was not properly notified of the hearing to which he failed to show up as an 8-year-old. According to Hatch, the filing of that motion placed an automatic stay on the deportation request initiated by ICE agents. “He is still eligible for a marriage waiver and has a good chance for an approved waiver as the spouse of a U.S. military officer,” Hatch said. Pamela Wilson, a spokesperson for U.S. Citizenship and Immigration Services’ southern regional office, said the office is prohibited by law from commenting on pending cases. Brown said he and Avila-Rodriguez first met about three years ago in Sanford, N.C., where the two lived. The couple married in January 2017 at a ceremony in Key West, Fla.
Brown has since come out publicly in the military and founded an LGBT advocacy organization called Get Out and Live, or GOaL, which he says advocates for LGBT equality and acceptance. Hatch said Avila-Rodriguez is not eligible for the DACA program put in place under the Obama administration and which the Trump administration is attempting to rescind. DACA allowed immigrants who entered the U.S. illegally as children to remain in the country and obtain a work permit for a two-year period that could be renewed. Although Trump issued a directive to end DACA, courts have placed a hold on discontinuing the program while efforts by supporters to block Trump from stopping the program are pending.